Major gratitude to Mr. Sosbee, who is reporting targeting and assault with EMF weapons himself, for speaking out on behalf of the thousands of wrongfully targeted and brutally assaulted Americans and others worldwide, and providing valuable insight into the extreme criminality and extensive corruption currently underway in America in the name of National Security. Journalists and human rights advocates and doctors and psychiatrists should note that Mr. Sosbee, like NSA whistleblower Karen Melton-Stewart, is speaking openly about the deadly and torturous use of electromagnetic weapons and Extremely Low Frequency weapons on targeted Americans; the reports of this weapon usage on people’s bodies should not be attributed to delusions or mental illness, as has been established in massive cover-up scenarios under the tutelage of corrupt Intelligence agencies. Such as, apparently, the FBI. For about a half century the fbi has tried to silence me from reporting on the horrendous crimes committed by the fbi against me and our citizens. I have determined during these 50 years that the fbi uses the United States Federal Magistrate Judges, i.e.,fmj (who are fully supported by federal district judges) as legal authority for fbi’s otherwise criminal assaults on people globally. fbi crimes against the populace include: torture, murder, forced suicide, extreme provocations such as assault and battery, threats by intimidation, blanket surveillance, interference with contract, employment and housing, etc., attacks by DEW/ELF. El Paso, Dallas, NYC, LA, Brownsville, McAllen. Several attempts are made by the fbi, under the authority of the federal magistrate judges, to kill me. See my websites for proof of these substantiated claims. See also my WRIT to SCOTUS who refused to hear my case of extreme and prolonged torture and attempted murder of my person by the fbi. Recently Facebook shut down my account when I spotted 2 fbi thugs/operatives on a video who were trying to drive a victim into forced suicide. The provocative assaults intended to lead to the arrest, imprisonment or death of the fbi Targets are authorized by criminally insane fmj. The fbi also sent operatives online at FACEBOOK to criticize the Target/victim for complaining. I defended the Target and wrote that the 2 fbi operatives whose faces were shown in the video are guilty as accessories to attempted murder. Then, the fbi deleted my FACEBOOK page. In the final analysis the judges who are controlled by the fbi are principals to all the crimes that I have outlined for about 50 years, including torture, attempted murder and presumably murder. America is doomed, unless the people demand justice for all the victims of fbi atrocities and crimes against humanity. In the Bizarro world of Mainstream Media (ticking with Mockingbirds), Psy Op Propaganda Pieces have become the norm now—as far as Surveillance Abuse by this rogue Surveillance Abuse State goes, and journalists with conscience continue to hide rather than step up to reveal the ongoing Crimes Against Humanity being perpetrated on civilian populations—in the name of Surveillance or National Security or both. Meanwhile the platter of weapons (covert RFID (radio frequency identifying device) implants, DEWs (directed energy weapons), sonic weapons, scalar weapons, BCI (brain computer interface) weapons, through-wall radar, nanotech rain) being used on citizens grows as “Homeland Security” shapeshifts into Domestic Terrorism—spelled out recently by NSA whistleblower Karen Melton-Stewart in this summary of the DHS Terrorist Watchlist Scam—and facile, wrongful placement of “Non-Investigative Subjects” coded “Silent Hits” on the corrupt FBI’s corrupt KST lists (Known or Suspected Terrorist) also grows into the hundreds of thousands, as this ACLU report details. Regardless, it has become convenient for the MockMedia to use the label “Targeted Individuals” and “TI Community” as shorthand for Mentally Ill, Paranoid, Schizoid, and to whip out articles every now and then to POPP this whopper home via the tried and true CounterIntel tricks of repetition and deception. In this light we have this latest which should have been labeled Mind Games: The Tortured (or Torturous? take your pick) Lies of CIA Minions, but apparently Ms. Yan was using the CIA AI Spell Check and couldn’t quite get there. In any case, this morning after an astonished read of this platter of lies and shoddy reportage, I penned a quick comment setting WIRED straight on what the Mental Health label on reporting victims of DOD/CIA crime is really all about, and noted that my comment was registered online. Later today, while discussing Ms. Yan’s little shocker of a Mocker with Dr. Katherine Horton, Oxford physicist and whistleblower on targeting crimes by Intel agencies, we made the transcontinental discovery that my comment had been removed from the Wired website. I checked Disqus, whose id I had used for my comment, and my comment was still recorded there, but “Detected as Spam.” I made a couple of screenshots of the Disqus comment, and post them below as public record. There’s really only one simple question for anyone contemplating this scenario to consider: Why would WIRED wish to remove—and indeed remove—my comment if it wasn’t hellbent on running a POPPCon on the American and world public, and my too-truthful comment wasn’t throwing a spanner in the works here? Do please read, ruminate, and decide for yourself. I have an alternate title for this s/hit piece on whistleblowers reporting the crimes of the rogue Surveillance Abuse & Torture State that this DOD/CIA fiction writer obviously works for: Mind Games the CIA/DOD Like to Play on Americans to Avoid Any Exposure of Their Dirty Surveillance Abuse and Outright Torture with EMF and Neuro Bio Weapons. Laura Yan obviously wishes to go down in history with Mike McPhate of the New York Times and other sad pretenders to journalism as a govt. propaganda artist keen to cover up the crimes of this dirty govt. Psychiatry and mental health are age-old magick tricks and deadly State tools of oppression the CIA, KGB, Stasi, Nazis and others have used to dismiss the reporting witness of weapons-testing, non-consensual experimentation, and extreme abuse of civilians. Please visit my site for the REAL journalism, documentary witness, and evidence of these crimes: http://www.everydayconcerned.net, and watch my interviews with whistleblowers at Ramola D Reports on Youtube, Vimeo, Bitchute, D-Tube. “Targeted Individuals” are as far from paranoia and mental illness as Laura Yan is from Truth; they are reporting the serious crimes of the CIA, DIA, NSA, FBI, USAF, DOD, NGA, DHS, and a host of other agencies, Universities, corporations. When people report serious crime–by these govt. agencies–the one and only fallback cover these thugs in power have is to call the reporters mentally ill. I am getting ready to expose this massive Psy Op the CIA/DOD is running on the American reading public–you can subscribe and follow at my sites to read it as soon as it is released. WIRED has previously published more information on the weapons being tested on Americans and others than Laura Yan shows any awareness of. The party line with all mainstream media of course (which WIRED is now replaying wholeheartedly), is that no weapons exist, surveillance does not include implantation and torture and stalking, and so on. Dream on, America! Note too that the elaborate comments posted here by various jokers congratulating each other on the acuity of their insight and depth of their caring for these sadly “mentally ill” TIs has the pawprints of CIA-NARRATIVE all over it….as a writer myself who has worked, taught, and continue to write in three genres–non-fiction, fiction, and poetry, I can assure you the CIA-NARRATIVE is rather easy to take apart–and I will take pleasure in doing so, in my upcoming article. Never forget however that the reason these Lies-in-Print by CIA/DOD agents or minions are published is primarily to cover up Ongoing Serious DOD/CIA Crimes. Need to Know Report No. 8: Detox & Stop Depop Nanotechnology/Aerosols with Suzanne Maher and Tony Pantelleresco, published last week, offers an educative and enlightening conversation with researchers and activists Suzanne Maher of Bye Bye Blue Sky and Tony Pantelleresco of AugmentInforce on the subject of what exactly is raining down on us via chem trails (an US Airforce term and a chilling reality still rejected by the unawake and uninformed as “conspiracy theory,” and ignorantly maligned as con-trails and jet exhaust), what it’s doing to our human and animal biology, and what we can do to stop this deadly onslaught on humanity. And deadly it is. These researchers discuss how the nanobiology, nanoparticulates, and nanotechnology entering our ground, water, skin, bodies and brains is working to break us down even as it self-assembles, replicates, and builds sensors and networks inside our bodies to facilitate AI interconnectivity; at a cellular level this transhumanizing invasion destroys tissue, colonizes hormonal receptors, creates biofilm, promotes cancer, weakens immune systems, and opens the door to autism and Alzheimer’s, among a slew of other diseases. Our DNA is being defaced, says Suzanne. Our fertility is being compromised. We are being transhumanized, and we—humanity as we know it—are being exterminated. Long-term chem trails activist Suzanne Maher explains that several kinds of contaminants are raining down on us, including heavy metal particulates, biological material which includes desiccated red blood cells, viruses, and fungi, and nanotechnology which includes nano microelectronic processors—nano MEMs, GEMs, carbon tubes, fibres, fullerenes, piezoelectric cells, smart dust or neural dust, all of which is entering our air, our water, our earth, our food, our lungs, digestive systems, blood streams, tissue, and brains. This extraordinary assault is occurring worldwide, and as each of us can confirm for ourselves wherever we live, is continuing to occur. Those chem trail planes haven’t stopped zigzagging across our skies, and the smoggy haze we frequently see hasn’t given away to pure air and clean atmospheres yet. Tony explains how nano silver interferes with the reproductive and sexual capabilities of men and how nano aluminium interferes with the reproductive and sexual health of women, by replacing key hormonal receptors and creating the base for malignancy and mutation at the cellular level. It’s important to peel the skin off fruits and vegetables, says Suzanne, to limit the nano intake we are getting. Even though it is indeed still embedded in the fruit itself, the extent of the infestation seems to reduce from skin through pulp to the seed. How will young parents feel about the organic fruits and vegetables they painstakingly buy for their babies and toddlers—when they learn nanosubstances pollute everything that is grown outside, under chem-trailed skies? The fact is, an all-out war is being waged on humanity as entrenched depopulation programs being covertly carried out by United Nations countries, as reported here earlier and detailed by UN scholar Kevin Galalae, have gone into accelerated mode in recent years. Not merely is our water being poisoned via fluoridation—a Nazi technique to keep the incarcerated passive and compliant—our breathing supply of air is now also being poisoned, and our water and earth and food supply is being poisoned, as detailed above. The intention is nothing less than genocide and mass depopulation via sickness and hastened death, an outcome apparently desired by the coterie of bloodline billionaires running shadow operations on humanity from behind elected governments and world bodies. The Georgia Guidestones, which should be the stuff of conspiracy theory and dystopian fiction, is unfortunately a manifest marker of this deluded vision in our material reality, and calls for a reduction of world population to 500 million. Deagel.com spells out the details; by this vision of gore, the US is anticipated to lose Americans so rapidly as to sink by 80% to 69 million by the year 2025; Germany will plummet to 40 million, half its current numbers; Netherlands by 20% to 13 million, and so on. These and other niceties of future life on earth are padded out in Agenda 21, a seemingly innocuous declaration of intent by the United Nations for the earth at large, involving, on the surface, preserving Nature and saving the environment while covertly blueprinting stack and pack cities, absolute and totalitarian control of all food and water, loss of human freedoms and rights, herding of rural dwellers into cities, confiscation of land and private property, loss of national and individual sovereignty, and global fascist governance. Dr. Eric Karlstrom describes these in a recent podcast; Rosa Koire has written and spoken extensively on this subject, as also Deborah Tavares, and Dr. Ileana Johnson Paugh, among others. Hallmarks of this scenario have been rolled out already—WiFi and ambient EMF from cell towers and antennas as everyone voluntarily attaches themselves to a cell phone or iPad, mass surveillance, and biometric surveillance. And worse (by this intention, unless stopped by us) is to come, as smart meters, the Internet of Things, and 5G promise nonstop pulsed microwave radiation directed via a full-service 24/7 earth-blanket grid over every cell of our bodies, homes, and continents. In addition, the covert stealth control grid of psychotronic weapons and mind control technologies, featuring cell towers, satellites, stealth antennas, microwave emitters, repeaters, portable DEWs, and brain frequencies pulsed in on power lines, flouroscent lights, television monitors and programs, is already in place, assaulting our brains, emotions, moods, thoughts, behavior, and action. All of this, says Suzanne Maher, is along the same spectrum of dominance over humanity, each element of assault is tied to the other as nanotechnology and heavy metals in the atmosphere make our bodies more conductive and AI-connected. Not merely are we being bombarded with mind control weaponry aiming to affect our minds, we’re being prepared like fatted calves with nanotech to receive the assault to maximum round-up detriment to our bodies and brains. Many are unprepared to deal with all this information on how we are being assaulted, many can barely believe it. Many are terrified when they are hear. It is terrifying, at a rather basic level, to contemplate that governments and corporations and technocrats with insane AI-and-immortality fantasies are working together to wipe out humanity—it would be far more comfortable to dismiss this thought—as mainstream media, arm of military-industrial-intelligence-complex propaganda, would have us do—as paranoid conspiracy theory. Fear is natural and normal, says Tony Pantelleresco, it proves you’re alive! But it is important to get beyond fear and its paralysis, to join forces with other awakened, informed and like-minded compatriots, and to start doing something. Whether it is to inform others, to support truth-media engaging in this struggle to inform and educate others, or to do the research yourself to figure out if this is all true, to start using your circle of influence to effect change, you must act. Humanity hangs in the balance, and we are each of us responsible. At the very least, we must detox and cleanse to maintain health. Simple, inexpensive ingredients can help wash out the nanotech and heavy metals and cure the effects of received radiation, says Tony, such as borax, baking soda, Epsom salts, and white vinegar (please watch the video for closer detail). Cleansing will yield results, even if only after a while. Not cleansing or detoxing is sure to leave the immune system burden festering in our bodies, primed to induce disease of all kinds. Tony Pantelleresco has a wealth of information on his website, as well as links to more information on natural health and detoxification, such as this compilation on anti-radiation treatments as well as information on his ongoing radio shows. He also collects information on technologies which affect our health, such as this compilation on Nanodata. 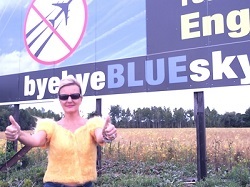 Suzanne Maher has long been running billboard campaigns, which anyone can support on her Go Fund Me Page for billboards, and recommends that others also run billboard campaigns to inform and educate people about the chem trails. Indeed, she reports, other activists are beginning to follow suit. There are many ways activists are informing others—with web sites, videos, talks, bumper stickers. Take action to convey your views to legislators. Because chem trails and the nano load they drop on our bodies is being hidden today by Geo-engineering and Weather Modification policies and activities presented in benign mode, educating legislators becomes critical. ZeroEngineering.com offers information and help and advice on changing laws and banning these nano aerosol programs, visit their website for more information. What’s most important is that we each answer the call, recognize how urgent the hour is, and act. Our actions WILL count. We CAN make a difference. But we must, indeed, get informed and make the decision to act.